Enliven teaching and learning with our range of interactive whiteboard systems. Designed to focus attention and provide a platform to boost the interactivity of your lessons, ActivBoard interactive whiteboards and Promethean's teaching software to provide the essential building blocks for any digitally connected classroom. Because each classroom is unique, Promethean ActivBoard Systems are available in a wide variety of configurations, enabling you to tailor the right solution to accommodate your needs. The Specktron LED comes with a multi-touch feature which is an effective presentations tool for sharing pictures, data, presentations, thoughts, ideas and business forecasts interactively. Engage the audience in action with direct computer control to capture even the most subtle intricacy. 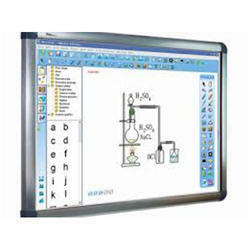 Multi-Touch Interactive LED Display Panel is the latest in teaching training classroom technology. A simple LED Surface with the multi-touch feature, a built-in hi-end computer which is interactive, and an Android OS built in for Apps and interactivity, several inputs to add external laptops or PCs or other video sources - for added interactivity! It is having WiFi, Bluetooth, USB Display and many more features. 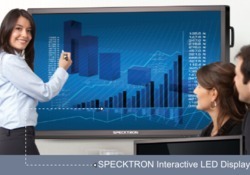 The Speck tron LED comes with a multi-touch feature which is an effective presentations tool for sharing pictures, data, presentations, thoughts, ideas and business forecasts interactively. 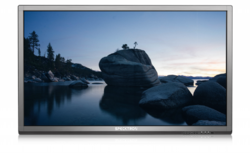 The Specktron LED comes with a multi-touch feature which is an effective presentations tool for sharing pictures, data, presentations, thoughts, ideas and business forecasts interactively. Looking for Interactive LED Display ?